From the 17th to the 19th of October at the breathtaking Cidade da Cultura in Santiago de Compostela, Spain, the 2018 YAMsession brought together musicians and artists from around the world. These were creative professionals who specialise in the creation of music for young audiences. Organised by JM International and JM Spain, the program delivered expert speakers, workshops and world-class showcase performances. View videos of the winning productions at yamawards.org/winners and watch the Facebook Live video of the YAMA ceremony on the YAM Facebook page. The 2018 YAMsession presented showcases from international music artists whose work had been masterfully designed to entertain and inspire young audiences. 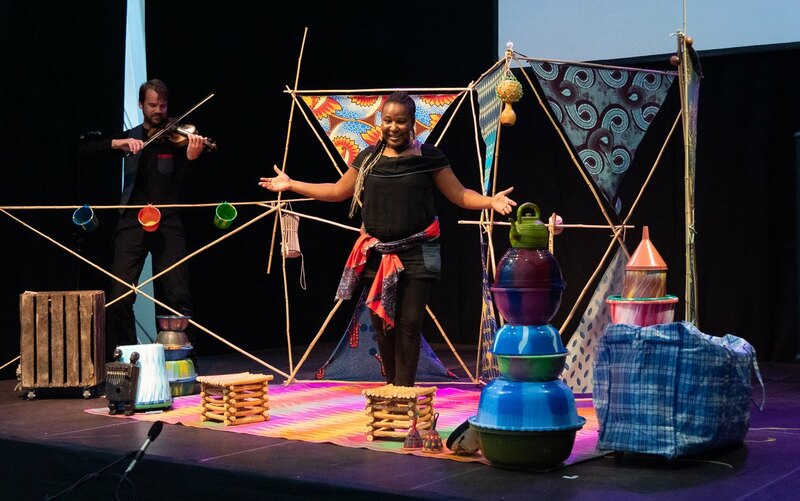 Over the course of the conference around 50 Galician children were invited to experience these performances and delegates could observe how the artists worked to capture their young audiences’ imagination. From the Fluteman’s (Germany) avant-garde flute and electronics extravaganza to Bach in the Street’s (Sweden) hip-hop-dance-meets-baroque fusion, every showcase tested the limits of what children’s music can be. Read more about the 2018 showcase productions at yamsession.org/showcases. Along with the showcases performances, delegates were treated to inspiration sessions given by expert speakers from the field of young audience development and culture more widely. Speakers at the 2018 YAMsession ranged from performers like US percussionist, producer and composer Michael Blair (Tom Waits, Elvis Costello and many more) to cultural policy experts like John Carnworth (WolfBrown consulting) and Carmela Catugno of the European Commission’s Creative Europe program. Some of the region’s most prestigious cultural and musical institutions were represented and delegates learned about audience development initiatives from Violeta Amargant, Head of Education at L’Auditori de Barcelona, and Jorge Prendas, Head of Education at Casa da Musica, Portugal. Finally, Sarah Goldfarb, founder of REMUA (Network of Musician-Speakers for Workshops) and Miguel Ángel Marín, Director of the music program at Fundación Juan March, shared their expertise for the delegates. More information on the speakers can be found at yamsession.org/speakers. As ever the 2018 YAMsession had a practical dimension in the form of the Producer’s Forum which was this year led by Virág Dezső and Ismo Railisson, who worked with musicians Marta Sancho Andrés & Brais González Pérez on the production How Do Our Poems Sound? After an initial performance, the musicians spent the conference working with Dezső and Railisson to develop their productions, demonstrating how performances can be customised for young audiences through the use of drama and concert design. A final performance on the final day demonstrated a radical transformation to the production designed to captivate young people. JMI was honoured that Galician Minister of Culture and Tourism Román Rodríguez González, was present to inaugurate the event, accompanied by the president of JM Spain Miquel Cuenca, and the director of the Young Audiences Music committee Ebbe Hoyrup. In his speech, Rodríguez stressed "the importance of cultivating and acquiring cultural habits from childhood, meaning that in Galicia we are working to make sure that literary, visual and performing arts and, of course, music, are known and enjoyed from childhood ". At the YAMawards ceremony awards were presented by Ebbe Hoyrup, Miquel Cuenca, Andrea González Pérez, President of Xuventudes Musicais de Tui, by Tuula Jukola-Nuorteva on behalf of RESEO, and by Maria Pereira, Cultural Director of the Cidade da Cultura. JMI would like to thank JM Spain for their tireless work organising this edition of the YAMsession, and to Cidade da Cultura and their team for hosting the event and making it such a success. Our thanks must also go to our sponsors: the EU Creative Europe Program and Belspo. Thank you also to our partners Xunta de Galicia, Xuventudes Musicais de Tui and Accion Cultural Española for supporting the 2018 YAMsession.